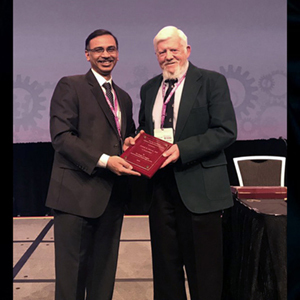 Dr. Frank Mitros was awarded the 2018 Gastrointestinal Pathology Society (GIPS) Harvey Goldman lifetime achievement award at the USCAP Annual Meeting in Vancouver. This award was initiated in 2015 to honor an active GIPS member for substantial contributions to the field of gastrointestinal pathology. Dr. Mitros has an earned reputation as a master teacher and as a mentor to scores of pathologists, including many academic pathologists. He participated significantly in the seminal descriptions of familial visceral myopathy and juvenile polyposis syndrome. His Atlas of Gastrointestinal Pathology (1988) is a revered text in the field. Dr. Mitros was a founding GIPS member, a longtime member of the GIPS Education Committee, and served as GIPS president in 1991-2. Frank was a critical member of the pioneering group of pathologists, nationally and internationally, who brought gastrointestinal pathology into the world of recognized subspecialties. His insightful teaching at all levels, coupled with humor and passion, made GI pathology an exciting part of the profession of anatomic pathology. Our specialty owes Frank a debt of gratitude for all he did for us over more than 3 decades. Dr. Harvey Goldman was a venerated member of the gastrointestinal pathology community, himself renowned as a master teacher, mentor, and insightful clinical researcher. He spent his career at Harvard Medical School, working at the hospitals that would ultimately merge to form Beth Israel Deaconess Medical Center. Dr. Mitros receiving this award is especially apt, as he notes Dr. Goldman to be one of his earliest and most important influences.